Agent Orange was the code name for an herbicide most used by the U.S. military during the American war in Vietnam to kill off the vegetation in the jungle and anywhere else our military thought the Viet Cong could hide. Agent Blue was used to destroy rice crops to deprive the Viet Cong of a food supply and to force villagers to flee to cities to deprive the Viet Cong of their base. Agent Orange had as its main component a form of dioxin. This meant that not only the trees, bushes or rice crops were destroyed but also many Vietnamese, Americans or American allies who happened to be in the area being sprayed died from Agent Orange either immediately or years down the road. Of those people who lived after being exposed to Agent Orange a high percentage suffered from cancers and other illnesses that lingered on for years. And finally, there was the genetic damage caused by being exposed to Agent Orange. Three generations are now affected by the damage caused by Agent Orange. The Vietnamese government estimates that at least four million Vietnamese are affected by the damage caused by Agent Orange. 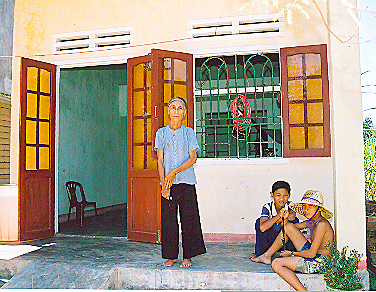 Madison Quakers, Inc. funded its first program to help victims of Agent Orange in the year 2005 for the family of Mrs. Nguyen Thi Ha (see side bar).We cannot undo the genetic damage done to the children of Vietnam today but we can make their lives easier and we do this through the construction of what the Vietnamese call Compassion Houses. These are two room cement and brick houses which give families like Mrs. Ha’s shelter from monsoon winds and rains. It gives them safety. They know now that someone cares for them and that gives them hope and with hope comes renewed strength. Father with his child, Dien Tho village, Nghe An province. His child is severely deformed from genetic damage caused by his exposure to Agent Orange during the American War. 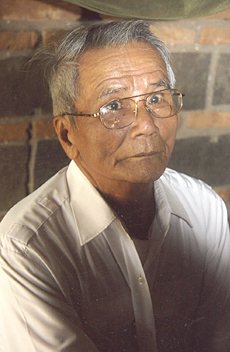 Colonel Cay was the Director of the Vietnamese Association for Victims of Agent Orange of Quang Ngai province. VAVA is MQI’s partner for the building of Compassion House for victims of Agent Orange. Colonel Cay and his family were profoundly affected by Agent Orange. Two of his three children died from the effects of Agent Orange and his third daughter is so seriously mentally and physically disabled that she cannot take care of herself and so lives with Colonel Cay and his wife. Colonel Cay had serious health problems himself but would always personally take us to meet other victims of Agent Orange. Mrs. Ha married a Vietnamese man more than twenty years ago. When their daughter was born it was obvious she had severe health problems. Mrs. Ha’s husband seeing this and the fact that his wife, Mrs. Ha, was growing deaf caused him to run away. They have never seen or heard from him since, leaving Mrs. Ha and her elderly mother to care for her severely damaged daughter. We first met Mrs. Ha and her family in 2005. They lived in a mud hovel, eking out a living from her small rice paddy. One of the health problems her daughter suffers from is an insatiable craving for water, so her grandmother must boil water continuously throughout the day. Drinking water all day means she is urinating all day. So, in addition to boiling water for her, her mother and grandmother are constantly cleaning the urine from her body. At some point during the day, however, her mother and grandmother must go to the fields to work so they have a little food to eat. They cannot take the little girl with them to the fields so they must tie her to a chair and clean her after they return from the fields. By that time she has been sitting in her urine for hours and her feet are caked with mud from her urine. We funded a Compassion House for this little girl, her mother and grandmother.